I would like to melt an object that is inside an other object and displace it horizontally. It should simulate liquid wax being ejected from a solid wax cube so it cannot be completely liquid and should solidify when the ejection is completed. I was using inflow simulation but it is too liquid and it falls apart. I need it to stay horizontal. I attach a figure, I am not sure it can help. As a test to find the correct wax melting settings, setup the following. Enter into Edit mode and subdivide the small cube about 50 times or more. Click on the bake, Once it finished you can play the animation and see the result. 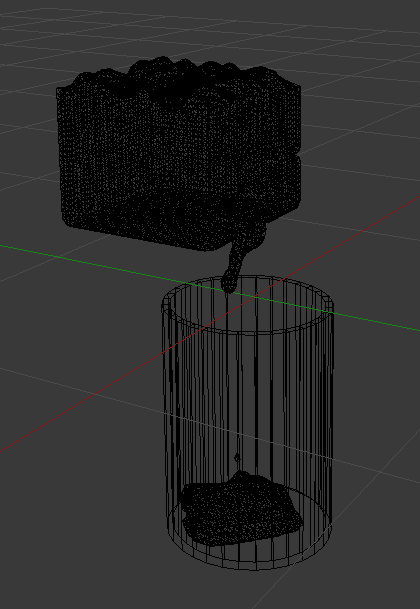 Do not forget to hide from Viewport and Rendering the cube that you setup to be the wax. Clicking the eye and the camera next to the wax object, see image top Cube.WaxCube object. Experiment with those settings to find the effect you are looking for, and after every change bake it to get the new settings to take effect. If you reduce the Compressibility further, would not go below 0.001, your bake time increases and if you increase the Grid Levels then the same will happen. Once you find the right settings then you can implement it in your project with materials and the right resolution and so on. The quality will be depending on the Final Resolution settings which also will effect your bake time, but for final I would set it to 200 at least to make it look good. 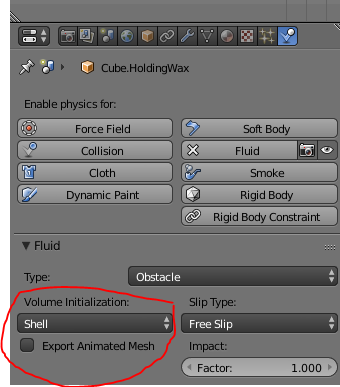 Do not forget to set the Physics for the wax holding container that has the hole in it to allow the side flow, like below with the Shell selected. 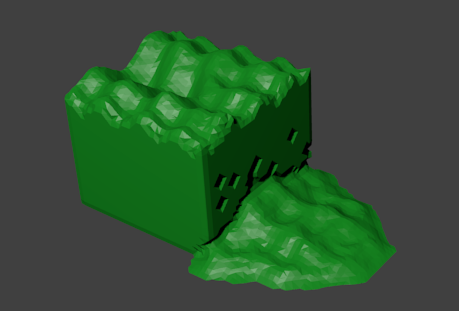 Also ad a Subdivision Surface modifier and set it to View and Render to 4. The below was created with the same setup but removed the cylinder and moved the fluid domain up to the bottom of the wax cube and assigned a material to it to make it visible. The wax 'catcher' in this case is only the fluid domain. The hole on the wax holding cube allowed the flowing out of it side ways. Of course, it was baked again for the new positions. This is only a rough demonstration. Not the answer you're looking for? Browse other questions tagged animation fluid-simulation displacement or ask your own question. Why will my fluid domain only bake once? Combining Fluid Simulation and Rigid Body Physics: How to melt a falling object? How can I combine multiple displace modifiers? How Can I Deform a Cloth During Simulation?